I will confess it, and only be slightly embarrassed: I'm having Royal Wedding withdrawal. I'm very sad about the fact that the next major British event for which I will have to get up crazy-early and watch TV is probably going to be Prince Philip or the Queen's funeral...perish the thought! 2am rolled around and found me a bit punchy I queued up BBC on the TV, the Today show on my laptop, and settled in for a long night - morning? I don't even know. Being a royals fan on the West Coast requires a truly punishing level of commitment and dedication to one's craft, darlings. Fortunately I wasn't alone in my already-punch-drunk craziness...Mama Bear had gotten up at 4am Central to keep me company, and we texted through the entire shebang...in addition to the 21 phone calls we clocked. Oops. I missed her so much during my solo viewing! After two cups of coffee, I switched to bubbly right in time for the main event. (I did NOT play the drinking game as previously planned because there was too much utter adoration happening on Harry's end, and I didn't want to black out before the end of the ceremony!) Although let's talk fascinators...and the people sporting them...my faves? Lady Kitty Spencer hands-down won the day for me - I loved her dress's bright color, gorgeous floral detail and her orange accessories. Second place to Amal Clooney (and her husband, that actor) - she is just so effortlessly amazingly gorgeous and that bright marigold yellow was so pretty! 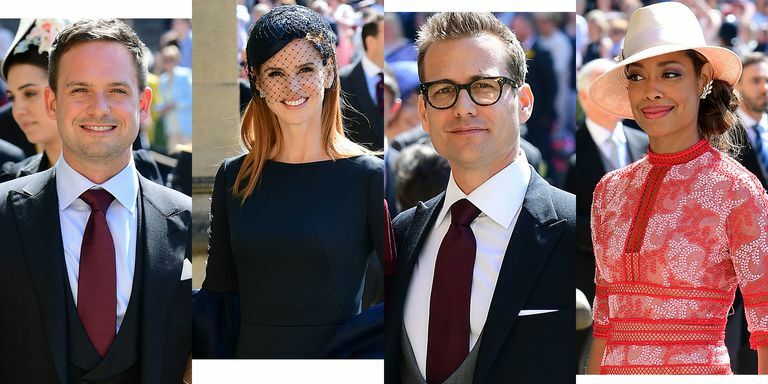 Additional credit to the cast of "Suits," who all brought it big-time. Also, Gabriel Macht (who plays Harvey) blew my mind in his cute thick-rimmed glasses. I have a raging crush now. What can I say? Guys in good glasses are one of my weaknesses. 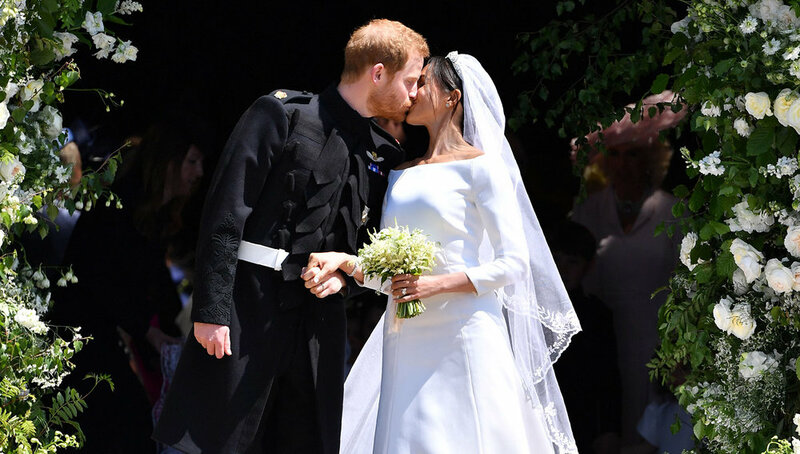 Not gonna lie, I was way "meh" on her dress after lots and lots of waffling back and forth on it...I loved the idea of the bateau neck and 3/4 sleeves (two of my absolute favorite things!!! ), but the fit was rumply and seemed too large. That veil, though? With the 53 hand-embroidered Commonwealth flowers, and that perfect silk tulle volume, and the stunning Queen Mary Filigree Bandeau Tiara holding it all in place?!? YES PLEASE. I would like it on record, fyi, that I ID'd the tiara before either "Today" OR the BBC, and therefore I win and should be awarded a tiara of my own. Or something. Anyway, I am HERE for the veil, and love the length and volume and drama - I just wish the dress either had a flawless fit or maybe just a leeetle something extra to it. I also died laughing at the fact that Prince Henry (Harry) married Meghan at St. George's, where Henry VIII is buried, on the 482nd anniversary of Henry VIII's beheading of his wife, Anne Boleyn. AND Henry VIII and Harry are both gingers. Laughed uproariously, campers. The overhead shot of the carriage ride, too - this looks like it should be on the cover of a romance novel or something. Also loved the detail that Harry hand-picked a few of the flowers in Meghan's bouquet - it's the utterly sweetest gesture and really makes me think these two are going to make it. Also, let us not ignore that kiss. I'm just a walking heart-eyes emoji over here. - I think Doria Ragland (Meghan's mother) is the epitome of class, taste and grace. Watching her all alone in what had to be an immensely overwhelming setting was touching. It's great that Meghan had her there to support her so perfectly. - I felt bad for Chelsy Davy, Harry's long-term ex - the coverage kept cutting to her and she looked so uncomfortable. Also felt sorry for Zara Tindall, Harry's cousin, who is like five million weeks pregnant and was squirming every time the TVs cut to her - those Quire seats at St. George's looked horribly uncomfortable. - This shot of the Queen arriving at Windsor before the wedding with Meghan's dog Guy made my LIFE. Of course the Queen has become besties with Meghan's dog. - I adored Meghan's reception dress. The glamour of her, Harry, and that Jaguar is beyond decadent. - The official portraits are also to die for, and I'm so glad they were released so fast! I cannot get over Prince George's cheeseball grin or how tightly Kate is holding onto Charlotte in the family shot - those two! And the couple shot - I don't think Harry has EVER looked so happy. I'm so obsessed with that little ginger hottie. - Speaking of Princess Charlotte...hi, I die, she's my favorite, end scene. And I don't care if this makes me a grinchy negative Nellie, but sorry crew - in the Cambridge v Sussex debate, I'm 100% #TeamCambridge. Kate for LIFE. Congrats, you crazy kids!! Have babies soon so I have something else about which to get way too excited!! Newer PostLove letters to life.